Making people discard cards in commander is usually a subpar tactic. Usually it ends up being a 1 for 1 trade (with cards like Duress, where you lose the card due to casting the spell, and one opponent discards a card) where you have parity instead of card advantage. As such, I have not included those types of cards despite their low CMC and an abundance of them available in the format. Instead, I’ve chosen to add creatures that have ETB discard effects, or those that force discarding upon combat damage. Some of the spells here would also fall under other categories, such as The Eldest Reborn which forces sacrifice, discard and has reanimator tacked on. Waste Not and Painful Quandary will benefit us further by giving benefits when cards are discarded. Patient Rebuilding is a light mill as well, but can net you some card draw and graveyard targets for our reanimator package. Speaking of, let’s take a look at that now. This is the bread and butter of this deck. Not only will we want to force our opponents to discard cards, but then we want to steal some of their better stuff. These cards allow you to target creatures in any graveyard and put them into play under your control. Or in the case of the Primordial or Liliana’s Ultimate, you can retrieve multiple creatures all at once. These also fall under the theft portion of our deck, something grixis colors are good at. Additional theft: Notion Thief will steal a card draw from someone, and is great if they cast something like Pull from Tomorrow, as they will only get the discard trigger, and you get to draw a card instead of them. Dragonlord Silumgar will steal a creature, and Bolas’s Clutches will steal you any permanent. Otherwise we have a pretty standard grixis removal package. The main win condition of the deck focuses on the Worldgorger Dragon and Animate Dead combo. Dance of the Dead or Necromancy can also be used instead of Animate Dead with the same effect. Essentially this combo gives infinite mana, infinite ETB triggers, and can flat out win you the game in certain ways. For the combo to work, you’ll need to get the Worldgorger Dragon into your graveyard. This can be done by either forcing yourself to discard it (by using Faithless Looting or Tormenting Voice) or using a creature like Taigam who will let you dump cards into the graveyard. Otherwise you might have to kill your own creature with a Terminate or something after playing him. From there, you target the dragon with Animate Dead (or alternates) and it’s ability will trigger, exiling all permanents you control along with the Animate Dead. When the enchantment is exiled, the dragon goes back to your graveyard and all your permanents come back to the battlefield, allowing you to make a new target with Animate Dead, if you choose the dragon this is an infinite loop until you decide to pick another creature in another graveyard. In between exiling, you can tap all your lands and mana rocks for mana and generate infinite mana. 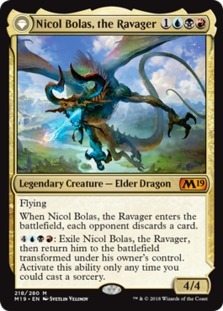 ETB’s on your dragons will also trigger each time, so cards like Bogardan Hellkite and Demanding Dragon will trigger their damage infinitely killing all your opponents. Alternatively with an Outpost Siege (naming Dragons) or Dragon Tempest on the board, each time your creatures are blinked you can do damage. Or you can use the infinite mana from this combo on Niv-Mizzet’s ability doing infinite damage. I’ve also included several tutor effects to get Worldgorger Dragon out of your library. Getting him in the graveyard may be more difficult but once you do it’s lights out. The rest of the deck is basically there to facilitate this combo, but you’ll have fun tormenting your friends in the meantime! You can view the full decklist here. In other news, Core 2019 was just released to MTG:A 2019. Bought a bunch of decks and trying to be responsible and replace cards instead of just adding them. Deck-bloat is a thing for me. I am sad to report there are no more destroy all enchant cards in play for green or black. That is one card I wish was still playable. Frustrated against white enchant/remove decks. There has been a few times where they had 5 or 6 of those up and I just wish there was a tool to deal with them all. Meh, I still can’t beleive there is any sort of balance in the game. There are so many crazy cards, decks, combos etc. it really is amazing. 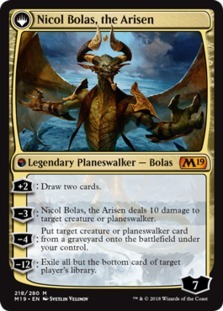 Yeah I heard it was being introduced into MTGA. This means standard has the largest card pool its had in years. I’m sure that shakes up the meta a bit as well. I feel like depending on the format there can be balance, but yeah, some cards are just outrageous. EDH is the best example of this, just because it pulls from the entire history of cards and there are some busted hidden gems out there.